London’s No.1 Hip-Hop and RnB party has assembled the best line up of DJs in the city for The Big One! 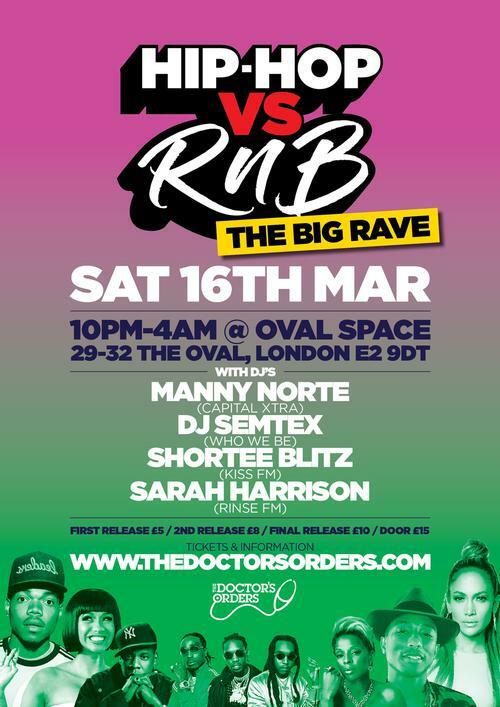 The hugely popular Hip-Hop vs RnB throws their biggest event to date in the brilliant Oval Space. Expect all the hottest brand new bangers as well as your throwback favourites from this dream team of DJs featuring two MOBO award winning DJs among the best names in the biz. Manny Norte, the name you can trust, has been smashing parties around the world for years. His MOBO Award winning club sets have seen him DJing for everyone from Jay-Z to Rihanna as well as every respected club around the world. DJ Semtex is so influential that Kanye himself has credited him with helping his career. He has rocked clubs & festivals around and always brings the heat focussed on the hottest sounds right now. MOBO award winner Shortee Blitz is one of the best loved and respected DJs on the planet. With over a decade on Kiss FM and a resident for 4Music’s In The Mix he is one of the most exciting turntablists in the world. Grab your cheap advance tickets for this incredible party now. This is going to be the biggest Hip-Hop & RnB rave of the year.